Every Macromedia conference I go to reminds me of a couple of things. First is that since I started attending in 1994, I've met a lot of people, and seeing them again as well as meeting more colleagues is almost more of a reason to go than anything else. Second is that no matter how hard I try, I can't get around to see everything. Third, there are a lot more products under the Macromedia banner these days than there used to be, and while I was fairly conversant with the majority of them back when they encompassed Authorware, Freehand, Director, Fontographer, Extreme 3D, and SoundEdit, the additions of recent years (and the programs that have fallen by the wayside) have brought that percentage down below half. UCON 2001 was no exception. What you'll read in this article is just a single viewpoint on a show that's covering an ever-expanding variety of products from someone who wants to be able to do everything but knows that isn't going to happen any more. Comments from other attendees are gathered at the end. The day before the main conference began, about 50 leaders of MMUGS from around the world gathered in the Hilton to meet for their third Summit, discuss ideas for how Macromedia can support the user groups, and see what kinds of free goodies they get. I've been to all three of them, and I've always been impressed by the folks from places like India, Chile, and Australia. Some of them don't make the kinds of salaries US developers do, others have to come an incredibly long distance, just to talk about user groups. But wherever they come from, these are the folks who spend a lot of time trying to find places to meet, round up speakers, and get people of a like mind together. The day started off with a keynote from President of Macromedia Products Kevin Lynch and Chief Technology Officer Jeremy Allaire. My primary impression of the presentation is from the end when I asked about the potential of support for Macromedia's newly-acquired server products (ColdFusion and JRun) on Mac OS X Server, and was told that there were no current plans. Ditto for the possibility of Cold Fusion Studio being ported to the Mac. Whatever your own opinion of using the Mac as a server is, there's no particular reason that the development studio shouldn't be made available to a sizable portion of the Web development community. Allaire expressed surprise that the leading Web server on that platform has been using a servlet engine based on JRun for several years. Of course, that happened before JRun's original developers were purchased by Allaire. Presentations of the UltraDev, Dreamweaver, Fireworks, Authorware, Flash, and Freehand followed to round out most of the morning. enlivened at one point by Kiruba Shankar (Chennai, India MMUG) telling one of the presenters to skip the product description and get to the good stuff. Most of the rest of the day was conducted by MMUG leaders themselves (sheparded by Macromedia User Group Specialist Gabriela Barragan and her counterpart from Allaire). Leaders discussed tips on keeping the groups interesting, the situation for groups outside the US, and made lists of the top concerns of groups. The day was capped by a presentation on Director 8.5, since the not-too-secret big announcement for the show was Shockwave 3D. More about that later. The evening was spent getting drenched while getting to dinner with Oregon MMUG leader Brad Smith. People say it rains a lot here in Oregon, which is true, but in New York City it rains a lot all at once. 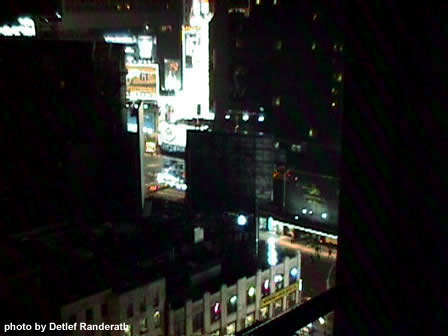 Phillip Kerman and I were sharing a spacious but inexpensive suite near Times Square, just a couple of blocks down from the Hilton where the show was taking place. Why Macromedia chose New York over San Francisco was a source of much debate. There are certainly many more people living within a 200-mile radius of NYC than there are around SF. It's closer to Europe. There are actually more hotels within a few blocks of the convention site then there are to Moscone Center (although the same could not be said for the NYC equivalent to Moscone: Javits Center). But the issue almost everyone I talked to at the show brought up was just how expensive it was to attend this year, with conference fees at $1395 and rooms at the Hilton ranging up from $250/night. For a three-day event, that's over $2,000 before you count in airfare or food. 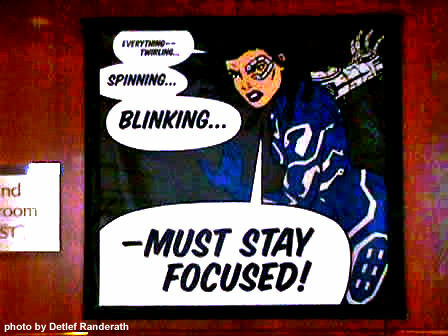 The conference halls were plastered with comic-style posters, a surprising number of which were really funny in a geeky sort of way. If anyone from Macromedia wants to send me a batch of them, call me and get my address. The facilities themselves were nice, but seemed a little small. The first UCON I attended was held at the San Francisco Marriott, just a couple blocks up from Moscone, and as I remember it, the rooms had a bit more space. It was almost as if once the decision had been made to move to New York to get more people to come that a counter-decision was made that they weren't actually going to attend, so a smaller space was rented to meet the diminished expectations. Several of the events I attended had people waiting outside of the doors to get in, not exactly the experience you or your employer wants to pay a couple grand for. The show got under way with what has to be one of the most downbeat kickoff speeches ever (not just at Macromedia), by CEO Rob Burgess. If I hadn't already been unemployed, I might have been concerned I was about to be laid off (as I write this, rumors are in the air that layoffs are actually taking place at Macromedia). Once Burgess got off the stage, things perked up a bit with Kevin Lynch and Jeremy Allaire, although they spent some time slamming high-bandwidth, low content Flash sites, preferring the clean lines of a couple of ecommerce sites that I didn't think were very impressive, either. Maybe they should just limit the size of exported Flash files to 100K and be done with it. I dropped into the exhibition hall where the Director Online kiosk had been brought in by Multimedia Handyman Will Turnage. We set up in space provided by Xtra developers Integration New Media, and answered questions on Flash and Director from whoever stopped by during the course of the exhibition. In addition to Will and myself, the kiosk was manned by Community Director Doug Brown, Lingo Lounge author Gary Rosenzweig, and one of Gary's employees at CleverMedia, Brian Robbins, known on the schedule simply as "Guest". Thanks to Vahé Kassardjian, Sandrine Campeau, Warren Stolow, and everyone else at INM for offering the space and putting up with us. One surprise element of the show was an entire track with a number of Shockwave 3D presentations that weren't on the original schedule for Wednesday and Thursday. This has to be one of the most head-scratching decisions made, considering that this one topic possibly could have drawn in many more developers to the conference. Of course, considering the size of the space, maybe that wouldn't have been such a good idea. An addendum to the conference gude was made available after the kickoff. There were 7 to 9 concurrent tracks going on at any one time. Two Flash tracks; Dreamweaver and Dreamweaver UltraDev tracks; two Dynamic Content tracks covering ColdFusion, Dreamweaver, Flash, Generator, and JRun in conjunction (apparently someone doesn't realize Director fits into that category a lot better than Flash does); and a catch-all User Experience track which appeared to have one of the two Authorware sessions in addition to bunches of stuff on usability. Surprisingly, nothing at all on Freehand 10 (announced at the conference). Half of the panelists on Tuesday afternoon's Creating Immersive User Experiences on the Web session were also doing duty at the DOUG kiosk. Doug Brown and Brian Robbins (see their comments on the show below) teamed up with Jake Saperstein of Macromedia and Mauricio Piacentini of Tabuleiro to talk about Shockwave 3D. Both Doug and Brian were showing off what they'd done with Director 8.5 during the beta, and Mauricio demonstrated Tabuleiro's upcoming Shapeshifter, a low-cost 3D import and modeling tool, implemented as a Director Xtra. The Sneak Peeks sessions at UCONs have always had their ups and downs, but there really didn't seem to be anything that stood out at all this year, apart from the costumes. Maybe I'm just jaded because I've seen the Shockwave 3D stuff for a while, but bookmarks in Flash movies? Ehhh. I almost wish some of the features in Director 8 had been shown. D8 came out after the last UCON, and every time I do an imaging Lingo trick in front of a Flash audience the inevitable reaction is "I didn't know Director could do that". Now was the time to show them. That and 3D, of course. For dinner, a dozen or so of the faithful wandered a block over to a fine Irish pub for dinner, to gird ourselves for the Gatherings, the usual informal discussions that take place during the UCON where product managers, engineers, quality assurance folks, and developer relations people take on all comers. I skipped by the Director Gathering at first to see what was up in the Flash world. As others have noted, the size of the Director crowd was considerably larger than the others, as was the number of Macromedia people involved. Just the list of official attendees in the conference guide for the Director group (Venu Venugopal, Chris Nuuja, Ken Day, Tom Higgins, Dave Simmons, and Dan Sadowski) almost equalled the combined Macromedia commitment to the other Gatherings, and several people were there who weren't on the list, like James Khazar and David Calaprice. My own personal nadir of the conference came during the Flash Gathering, when I asked Eric Wittman, Director of Product Development, Flash, about the possibility of cooperation with the Shockwave Multiuser Server team to get Flash and Director talking to the same in-house server product. My point was that since Flash 5 never shipped with any backend server that could accept the XMLSocket connections, wouldn't it be nice if -- rather than forcing non-Java coders like myself to write one from scratch -- there could be some effort to add that functionality to the SMUS. He told me in no uncertain terms that it wasn't ever going to happen, explaining that I should use ASP or perhaps Branden Hall's aquaserver, a functional but extremely limited chat server. When I replied that ASP couldn't really support the kind of persistent connections the SMUS and XMLSockets do, and that Hall's server wasn't exactly as robust or full-featured as the SMUS, he shut that portion of the discussion down. It's exchanges like this that make you wonder whether the Flash people actually know what the SMUS can do (as opposed to the other exchanges I've had in which they don't appear to have ever heard of it). I decided to go to ground in the Director group. Later in the evening, while I was getting something to drink, I talked to Mike Williams of Flash Product Management about the exchange, intending to try to smooth things over. He told me that there had been some effort to integrate the products, but that with the acquisition of Allaire, all of the server products were going to be re-evaluated, and that the Flash team considered Cold Fusion and JRun, or Xadra's Fortress better platforms for multiuser experiences. Not exactly the kind of news you want to hear on the day the company announces the Shockwave Multiuser Server 3.0 with its 2,000 simultaneous connections. Needless to say, I didn't feel very smoothed. Considering that a few months after 8.5 ships that there will be potentially tens of thousands of servers that could have made persistent connections to both Director and Flash in the hands of developers, and that Lingo can be used as a backend scripting language on the SMUS 3.0, the failure to do anything on this front from either side seems incredibly short-sighted. It's not like nobody's been asking about it for over a year. After a night of tossing, turning, and muttering to myself, it was back to the grind. Tom Higgins's An Introduction to Shockwave 3D was a good way to start the day, He discussed the various features and capabilities of Shockwave 3D, from authoring the W3D format developed by Macromedia and Intel to Lingo control of shading and rendering. Depending on who's counting, something like 300-900 new Lingo terms, either entirely new or with a new usage for 3D. Check out the feature set at Macromedia. Start early, because the curve is a long one. One of the more entertaining seminars I saw only part of. The folks at Havok have been developing real-time physics engines for several years in the 3D community, and their 3D engine is going to be built into Shockwave 3D as a downloadable Xtra. You can assign mass and other properties to objects in a 3D world through Lingo or the use of a plugin to a 3D modeling program, then let the Xtra figure out collisions, movement, and other rigid-body dynamics. Incredibly useful stuff. After lunch, I went to the Director 8.5 Exporters from 3D Applications session, presided over by James Khazar, Developer Relations Manager for Director and Shockwave Player. Representatives were there from Alias, Discreet, NewTek, and SoftImage, to show off how they would work with Shockwave 3D. The guy from Alias (which produces Maya) was at a bit of a disadvantage at a show where interactive 3D was the current theme. because apparently the exporter isn't quite done, and his static slides didn't quite match up to the presentation from the Discreet (Studio Max) representative who could actually show something, since the Max is considered the primary content creation tool by the SW3D development team. This is where I beg to differ a bit from the party line. For one, Max is Windows-only, and there are still a lot of developers out there on Macs, particularly in the creative departments. Baseline pricing for Max is about $3,500. Character Studio, one of the more common Max plugins used for character animation is another $1,000. reactor, the Havok physics plug-in for Max is yet another $1,000. My own plan to promote SW3D technology would have started from the other end of the pricing spectrum, in the interests of making sure every possible Director developer who wanted to do 3D content could, without going out and buying $5K+ of software, particularly since there are a number of good animation tools out there that are considerably less. The folks at Macromedia say that there are about 40 3D vendors out there who will have agreed to do export plugins for the W3D file format, including a number of them on the sub-$1,000 range. It's a little disconcerting not to see them yet, though, considering that Director 8.5 was supposed to ship last year. 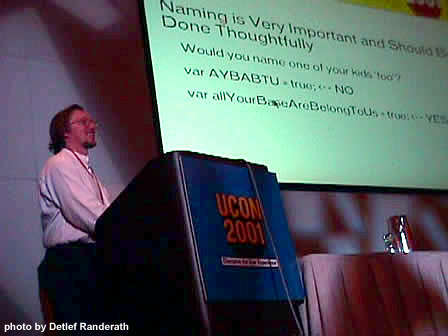 Kenneth Woodruff, the presenter from NewTek (Lightwave) was like a breath of fresh air. He spent several years doing Director work prior to joining NewTek, for one, and he had some neat things to show. When I'd asked about exporting animations (as opposed to static models) in other seminars, I'd been told that only Max would support that feature. Although it is possible to control elements of a model through Lingo, for simple animations that seemed to be overkill. And using Lingo to create a bones animation walk cycle (something that almost anyone working in 3D might need at some point) that can be triggered by a Lingo command isn't something for the faint of heart. So when the beta version of the Lightwave exporter was shown exporting not only animation but also an atmospheric effect, you had to be happy. It's still $2,500 (although Woodruff said to keep an eye out for discounts aimed at Director developers), but the attitude in this part of the session was a radical shift away from the previous thrust. Lightwave and Maya were the only products with Mac OS X versions (or any Mac versions). The SoftImage presentation seemed to be more of a focus group session. First, we got a 5-minute video of guys with goatees talking about how great the tool was, along with a lot of film effects work that wasn't particularly germane to the area of interactive, real-time 3D. They may or may not develop a W3D exporter, depending on their market research. I may or may not have $50K to spend on 3D software this year. I missed the presentation by Jeffrey Abouaf (the 3D Technologies Artist in Residence at Macromedia) on Doing the Right Thing: 3D Authoring Products for Shockwave 3D because I was working the booth, but he's considering writing some articles for DOUG. 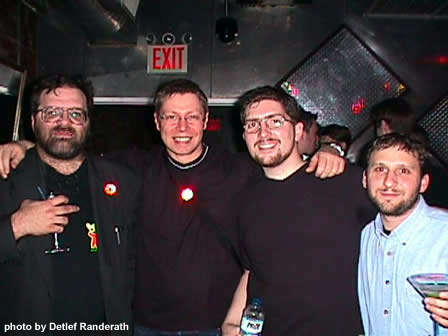 Wednesday night was the big free food, free drinks party at EXIT, on West 56th Street (that's me, Detlef Randerath of Europop, Will Turnage, and Gary Rosenzweig above). We were able to find a good place to talk near the bar and food, and we got there early so we could grab a couple of clip-on flashing lights. No idea who the band was, but that's hardly the most important thing. Nothing like a night of drinking to prepare you for an early morning seminar on Game Design with Shockwave 3D. At least that's how it seemed a lot of the attendees were feeling. People who missed it, though, lost out on a great presentation hosted by James Khazar and featuring Danny Kodicek of Wellspring Interactive, Rebecca Lovelace of Havas Interactive, and Lucas Meijer of MACH8. 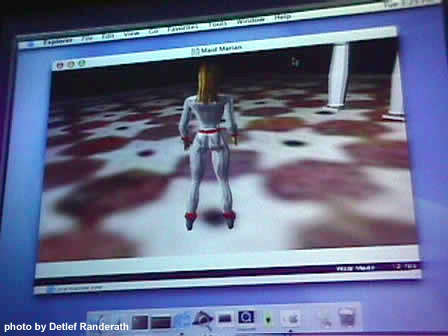 Danny's presentation included a version of a light cycle game inspired by the code name of the Director 8.5 beta: Tron. In Danny's version, instead of seeing the grid from a top-down mode, you see things from the rider's point of view. Much, much harder. he also dissed the concept of doing something in 3D simply because you have 3D available (I believe a certain popular board game was mentioned). Rebecca then showed her version of a breakout game, which -- while breaking Danny's rules about 3D usage in games -- was created entirely in Lingo by using the primitives available in Director 8.5's 3D Lingo. Lucas showed some examples of models he developed for use in Director, as well as the MaxScript language that can be used for dynamic modeling inside Max. In the next session I attended, David Simmons, the senior engineer for the Shockwave Multiuser Server and Gary Rosenzweig of CleverMedia discussed how to build multiuser sites, how to group users together into rooms or tables, and what to do when users drop out, as well as some of the new features of the SMUS 3.0. Then it was off to lunch, after which the exhibit hall had to come down. I shipped the kiosk home and dropped in on the end of Terry Schussler's packed Tips and Tricks in Lingo seminar where even I learned something, but didn't have time to take notes (the photo above is from his ActionScript seminar on Tuesday, there's no var statement in Lingo, silly). This year's People's Choice Award nominees were represented at the show by a few kiosks showing canned presentations. 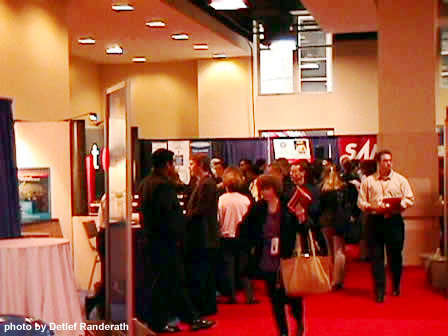 In past years, there has been a large room with each nominee getting its own kiosk that people could actually try out. Plus, there were print awards for the Freehand and Fontographer people. I guess now that New Media isn't a sponsor that print is dead. I didn't bother going to the award ceremony. Will Turnage, Detlef Randerath, Danny Kodicek, and I met for dinner after the show to decompress and talk things over. As you can probably guess, impressions varied even among regular UCON attendees. I came away from this show wanting more, but I couldn't tell you exactly more of what. More time, probably, to examine the various products. More time to talk to my colleagues in person. More time to discuss tools with vendors in the exhibit hall. Maybe some repeated and staggered seminars so that one person can cover more ground. Overall, I left UCON wanting do be able to get some 3D work so that I can really dive into the new Lingo. I love the new stuff. Will someone please, PLEASE teach Rob Burgess how to say 'Director' in a presentation? 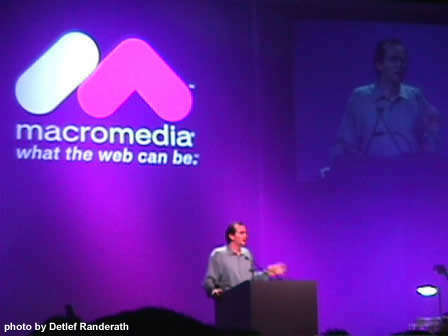 In his portion of the keynote he mentioned every Macromedia product, by name, except for Director and Authorware. I think he might have mumbled the word 'Shockwave' once. Of course Director was then showcased for about one-third of the overall keynote program. I've understood not mentioning Director by name in the past over the course of the last six months, since Tron was in development, but this was the flagship product kickoff here, and he still couldn't bring himself to say the word. That's the kind of thing that makes quite a few developers wonder if something's wrong. The 'live' demo and voting for the People's Choice awards wasn't as nice as UCON '99 where you could play with the entries on kiosks. I found myself not wanting to vote for any of the entries this year. The presentation rooms weren't big enough. People were being turned away from Director sessions because of the fire code. Here's hoping the Moscone has already been scheduled for the next UCON. Biggest, personal laugh of the conference: the announcement of Freehand 10 being the first large-scale application available for OSX, and then promptly doing the entire demo on Win2K. Ouch. It was my first UCON, so I didn't go in with a lot of expectations, other than thinking that most of the conference would be Flash based. I agree with Doug that things would have been better if the Director track could have been mentioned beforehand, but I don't know how that would have been possible. Past that, there seemed to be lots of support both within MM, and in the community for Director. Several people have mentioned on the lists that the Director Gathering had more people, and lasted longer, than the Gatherings for any other product. That alone should finally kill the "Director is dead" discussion. Additionally, everyone who was not involved with the beta seemed to be very impressed with the amount of effort, and quality of 8.5. All in all it seemed to be a great launch to the product. Getting back to the conference in general, the sessions that I attended were all very well done, although the majority of them were in too small of a room. The expo floor had a decent amount, and selection of exhibitors, although the big column in the middle of the room made it feel smaller than it actually was. I heard from someone that about 1500 people attended, and if I remember right, the last one had 6000 attendees. If that is indeed the case, then perhaps the Moscone center is a better location. Overall, I would have to say that UCON was probably the best overall conference that I have ever been to. I guess I should qualify that by saying the only other conferences I have been to were the past two Game Developer's Conferences. I agree with everything Doug said. Well put Doug. I felt a very strong passion among the Director developers. Macromedia definitely needs to give as much PR support to Director as they do Flash (they appear to be giving plenty of engineering support, which is why I mention PR). At the evening gatherings, Director developers outnumbered all other developers combined -- and they stayed twice as long. They literally had to throw about 75 of us out of that room after midnight. Director developers pay a lot more for the product and are probably responsible for a good percentage of the Flash sales too (they use it to create Flash cast members). I'm sick of seeing Director ignored. Heck, I love Flash too (just wrote a book about it), but from a business standpoint I think Macromedia needs to let Director developers know they still care about the product. Other comments: Where were the hacker sessions? A big part of the past conferences were the times that we could show off our cool stuff to each other, seek help from peers and engineers. Also, a good opportunity was missed at the Sneak Peaks to show off some hidden features in 8.5 (like the new fill shape function). This would have gotten some developers to pay the $199 even if they didn't need 3D at the moment. Finally: New York. BIG MISTAKE. Could there be a more expensive place to have the conference? The rooms were $280 per night! Fights were expensive. All in this year of the Internet collapse. There are a lot better places to have a conference. Denver, for instance: Short, cheap flights to all US cities, direct flights to London, cheap rooms. http://webdevcon.com is putting on a conference of similar size this June for a fraction of the cost. Or how about Seattle, Atlanta, Minneapolis, Chicago: all much better than NY. BTW, the Hilton had nice hotel rooms, but the conference areas were cheesy and dirty. I felt like I was in some sort of college newspaper editors conference.